A drilling program in western Victoria has seen the successful deployment of an early concept system of DET CRC’s Lab-at-RigTM system. The drilling program is a collaboration between Geoscience Australia and the Deep Exploration Technologies Cooperative Research Centre (DET CRC) in the Stavely Zone of Victoria which aims to reveal the hidden mineral potential of Australia’s buried but prospective geology. Geoscience Australia is collaborating with the Geological Survey of Victoria within this drilling program to test a new geological interpretation of the Stavely Zone of western Victoria that seeks key geological indicators of potential new mineral provinces hosting metals such as gold, copper, nickel and other base metals. The drilling program is also testing and refining DET CRC’s Lab-at-RigTM system, which provides geochemical and mineralogical information on drilling samples as they are recovered. The data are being uploaded to the cloud for near real-time, remote access. DET CRC CEO Richard Hillis said new technologies such as the Lab-at-RigTM seek to inform drilling decisions and, in due course, to replace time-consuming and expensive lab-based assays of drilling samples. “This drilling program is providing an important field test and an opportunity to ‘pull through’ the new technologies that will be required to explore the 80% of the Australian continent where mineral deposits are hidden beneath barren cover,” he said. The DET CRC Lab-at-RigTM team from CSIRO, Reflex and OIympus is working closely with driller and DET CRC Participant Boart Longyear and with Geoscience Australia to deploy the trailer-mounted X-Ray Fluorescence (XRF) and X-Ray Diffraction (XRD) system that provides near real-time geochemistry and mineralogy during diamond drilling. The Olympus contribution to the project involves team members and technologies developed for NASA’s Mars Curiosity Rover. The system is being used to test the workflows of top-of-hole analytical systems and integrated data infrastructure that will feed important learnings into the engineering of the final Lab-at-RigTM solution. The project testing uses the Reflex Connect and Terra portable analyser technology, coupled with sampling workflows and data management through the Reflex HUB, all deployed in a mobile unit. Data is delivered to Geoscience Australia geologists during drilling, giving important early information about the location of key geological horizons before detailed geological logging of the core. “It was exciting to be able to login to the Reflex HUB from Perth and see that the drill rig in Victoria had crossed a critical boundary,” said DET CRC Lab-at-RigTM Project Leader James Cleverley. DET CRC has also successfully deployed its logging-while-drilling solution, the AutoSondeTM, during the drilling program. The AutoSondeTM, which currently records a natural gamma log, but to which additional sensors are being added, is pumped down inside the drill rods by the driller and logs as the rods are pulled out of the hole. The AutoSondeTM is deployed by the driller removing the need for a separate conventional wireline logging crew or additional rig time, thus reducing the costs of recovering geophysical logging information. The AutoSondeTM also largely negates the risk of hole collapse prior to or during logging. 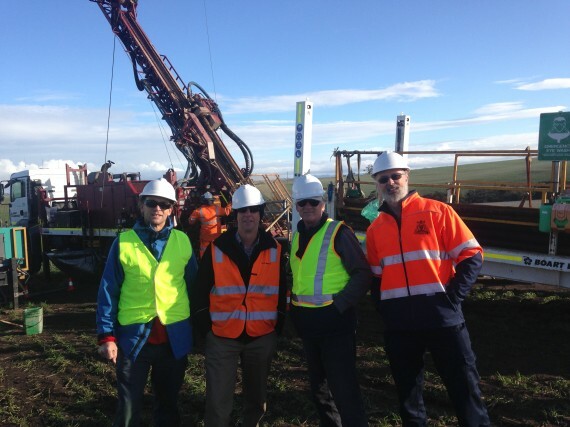 A delegation from DET CRC and Geoscience Australia visited the Stavely drilling site in late June, including DET CRC Chair Tom Whiting, DET CRC CEO Richard Hillis, Geoscience Australia CEO Chris Pigram and Director Geological Survey of Victoria Paul McDonald.